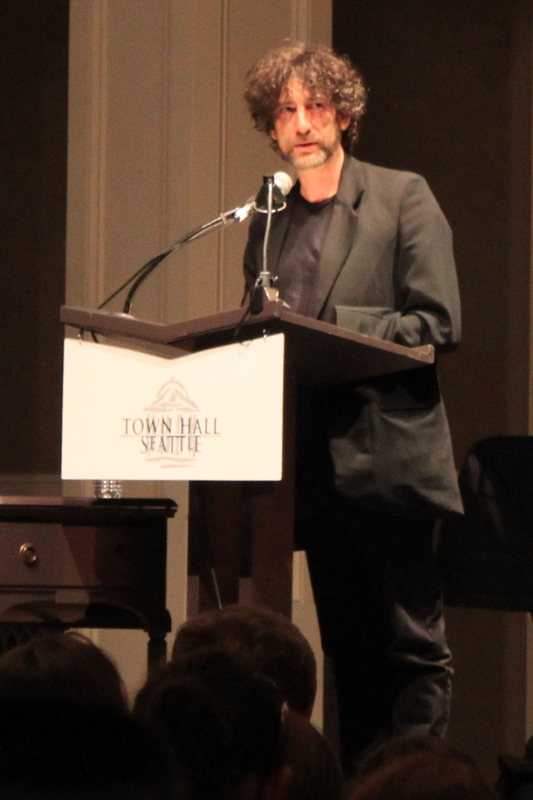 This evening, I joined about 2,000 fellow geeks at Town Hall in Seattle to see Neil Gaiman do a reading and be interviewed by Maria Headley. I’ve been attending a lot of author signings recently, but this one was particularly special, because if there’s any author working today whom I actually idolize, it’s Neil Gaiman. (I wouldn’t just dress up as any author for Halloween, after all.) On top of that, he’s not just an excellent writer, he’s also a great public speaker and oral storyteller. For many authors, skill with the written word does not go hand-in-hand with public speaking (I suspect I’m one of them), but Neil Gaiman is superb in both arenas, and if you ever get the chance to hear him speak, I definitely recommend it. There will always be better writers out there than you. But, there is no one else who can tell your stories. So the sooner you stop trying to tell other people’s stories, and start telling your own, the better off you’ll be. And he’s right. New writers, myself included, do start out by trying (often unconsciously) to emulate our favorite authors. But with enough practice, you eventually find your own voice, and that’s when you really start writing stories that are truly your own. It’s good to remember, because as a new writer, it’s easy to read stuff by great authors (like Gaiman) and think, Oh, geez, he’s such a better writer than I am! I’ll never be able to write the kind of awesome stuff what he does! I’m doomed to failure! And it’s true. You’ll never be able to write like Neil Gaiman. But if you’re true to your own voice, if you write your own stories, and bring to them your own unique set of experiences and passions, then Neil Gaiman won’t be able to write like you, either. The thought made me smile– it’s not about being better, or best. It’s about being you. So with that in mind, I took my newly acquired signed copies of Neverwhere and American Gods (pre-signed, because an author signing with 2,000 people would just be painful), and headed home to write. Rumor has it Neil may be back in town in November with his wife, Amanda Palmer, for something involving both reading and music. If so, I’ll definitely be there.